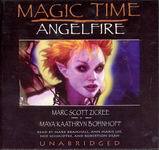 Magic Time: Angelfire is the second book in what could become a long series of novels. 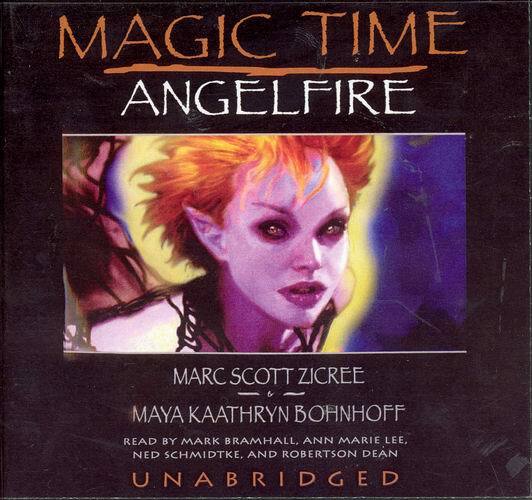 Marc Scott Zicree personally introduces the book, saying that it was originally pitched as a TV series, and very well might have been a good one. Here in this novel, Cal Griffin and a band of people travel the post-apocalyptic, non-technological, magic-filled America in search of the source of it all. The book seems written for TV; the characters are strong, distinct, and quirky. The dialog is full of current colloquialisms. The images are vividly visual. And the action comes fast and constant, with the characters fighting dark creatures while getting closer and closer to their goal. The novel’s chapters are each told in first person from one of the character’s point of view. A different reader is used for each character, and the actors all do a very good job portraying their character. Ann Marie Lee has a fantastic voice, but had to maintain an intense angry attitude throughout that made me wish her character would calm down, maybe have a decaf latte or something. The idea behind the novel was good, and, if it ever makes it to TV, would be a series I would check out. I wouldn’t stick with it, though, if the series didn’t go any deeper than a formulaic string of action sequences designed to increase tension. I was interested in the characters and what they were going through, but longed for something a bit more. Of course, leaving a reader wanting more is good thing for a storyteller to do. The cover is graced with an excellent piece of artwork by Iain McCaig of what I believe is a “flare” – a type of creature that some folks were transformed into when the world went awry.